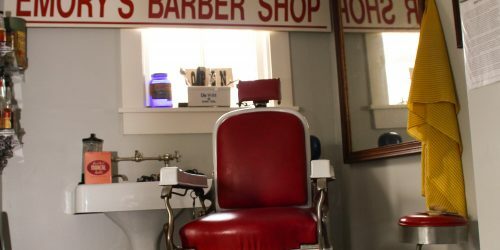 The Historical Society has recreated a barber shop display from one of the most well known and loved barber's in downtown Kent. Emory Vance started working at what had been Murphy's barber shop in 1962 and purchased the business in 1987. The shop was located in the heart of downtown Kent at 147 South Water Street and was a favorite of many Kent area residents. KHS is happy to display the 1919 barber chair, sink, mirror and supplies from a very special former Kent Business.